felt like uploading something because i've been pretty inactive, so voila, something i did in march. xD; i didn't take the time to edit it though, just changed the sig. this was intended to be a fairly quickly, very simple piece. the simple remained because additional elements didn't feel right; the quick, not so much. it dragged out somewhat mainly because i felt "stuck" the entire time while walling. 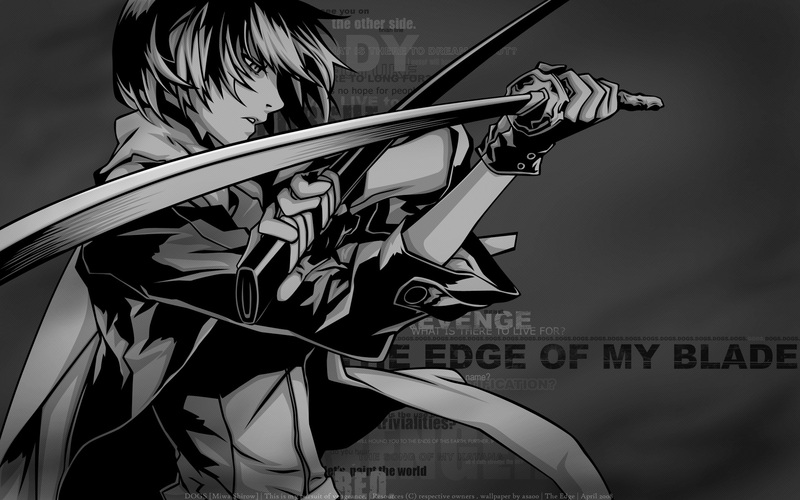 it's grayscale because 1) i didn't want to color naoto (just manga scan vector + extra shading layers); 2) my personal feeling that grays bring a sort of impact that colors can't in this case. it's fun layering text and using masks to turn a couple of fonts into a whole bunch of "fonts". xD; i'm aware that the text is an either "you like it or you don't" thing, but since i'm in the first group, so the text is here to stay. pattern-as-texture came from the awesome squidfingers. As usual great job on the details. I love the monochrome style. His pose screams out 'bada$$' and he's without a doubt h-o-t! Great job! I love your idea of making a text background. i wanna be one of this babes:))good walp! makes him much more cooler than he already is! i agree that gray scale is great! 0.o WOW!This is so cool.The BG matches that character. I Lovee picture/wallpapers with guys with swords/samurai's. She's so sad... Beautiful work!